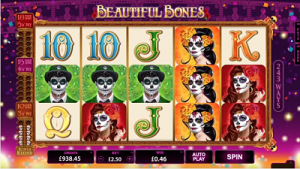 Beautiful Bones slot by Microgaming celebrates Dia de los Muertos. Microgaming’s broad offer of high quality titles has welcomed the latest addition, an action-packed title called Beautiful Bones. The five-reel video slot is inspired by one of the most famous Mexican holidays, Dia de los Muertos or Day of the Dead, and brings 243 different ways to win payouts. David Reynolds, games publisher at Microgaming, said this release brought a top-notch game engine where the players could choose their reward. Launched back in May, Beautiful Bones is a medium variance game – meaning the payouts are well balanced, with an RTP of 97%. With two superb features and with colourful and glitzy graphics, this title promises lots of action and many opportunities to win hefty rewards. Betting starts at $0.30 and goes all the way up to $15 per spin. The game’s bonus features can prove very lucrative, so you should make the most out of them. The Wild Spin Again feature is triggered when you get a three of a kind winning combination, making the middle position of the win a Wild. The player then receives a free respin, while the Wild is held in place. The Free Spins is definitely the game’s main feature which is activated when 10 sugar skull Scatters get collected. Let’s explain this a bit further. Every time a Scatter symbol lands on the reel, it gets added to the sugar skull meter. A player can choose either to trigger the game immediately after receiving 10 Scatters, or he can accumulate up to 30 of them. Upon the feature activation with 10 Scatters, you’ll get 10 spins while all wins will be trebled! But there’s more in store for those patient enough. Collect 20 Scatters and receive 15 free spins with a X4 multipliers, or collect 30 of them to get 15 spins and an even larger multiplier of X5. Be sure to check this game out, no matter if you’re a penny punter or a high roller. You’ll still have lots of fun, and still win a handsome 1,000 times your total stake with a single spin!